Shop Westin Bull Bars , Westin Bumpers , Westin Side Steps & Running Boards , Truck Bed Accessories , and back to Westin or Shop By Brand. Looking for the very best and biggest in bull bars? 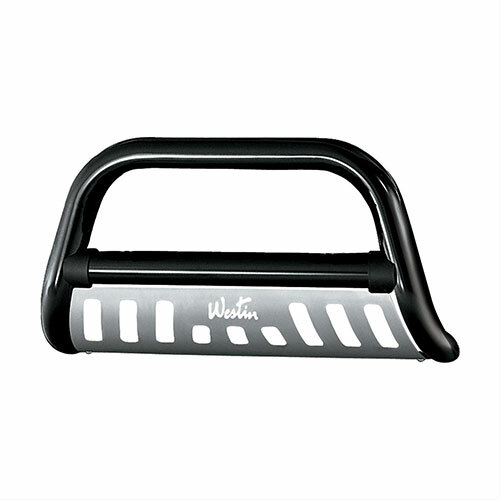 Westin’s Contour 3.5” Bull Bar is much larger, stronger and better looking than the traditional bars on the market. Specially designed to curve the front end of the truck, it provides additional protection to your front-end and gives your truck a striking appearance that is guaranteed to impress. Built for maximum durability, each Westin bull bar is made of 3.5-inch diameter steel tubing that provides heavy-duty strength and resistance from flying debris. Designed with style in mind, the Westin bull bar comes in semi-gloss black, black textured or a stainless-steel finish that gives your vehicle a sleek and rugged appearance. And, if you’re in need of some extra lighting for added flair or functionality, the bars feature pre-drilled holes for mounting auxiliary lights. At AutoEQ, we offer the Westin Contour 3.5” Bull Bar for a number of leading trucks and SUVs like the Dodge Ram, Ford F-series, Nissan Titan, the Chevrolet Suburban, and Toyota 4Runner. And when you shop with us, you’ll receive our unbeatable price guarantee and fast free shipping, along with a 3-year unbeatable Westin warranty that ensures quality craftsmanship.